December 2015. Williams Tower Wow: Uptown's best art space is hidden in plain sight in the Williams Tower Gallery. 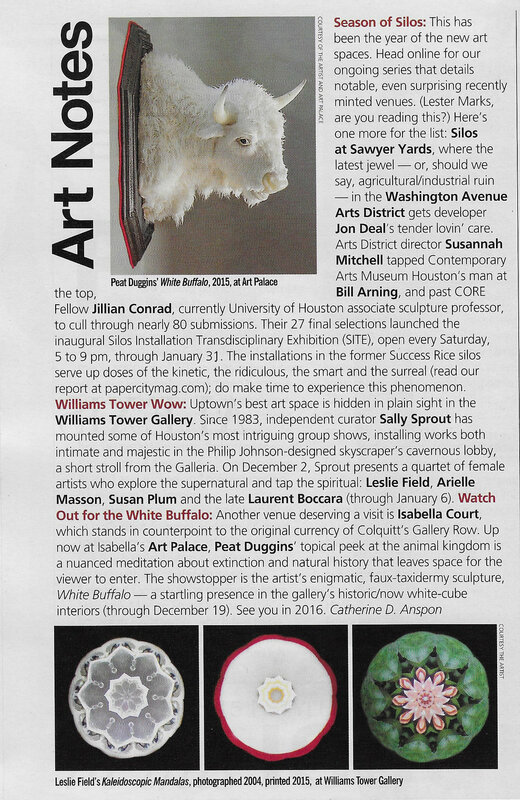 Since 1983, independent curator Sally Sprout has mounted some of Houston's most intriguing group shows, installing works both intimate and majestic in the Philip Johnson-designed skyscraper's cavernous lobby, a short stroll from the Galleria. On December 2, Sprout presents a quartet of female artists who explore the supernatural and tap the spiritual: Leslie Field, Arielle Masson, Susan Plum, and the late Laurent Boccara. 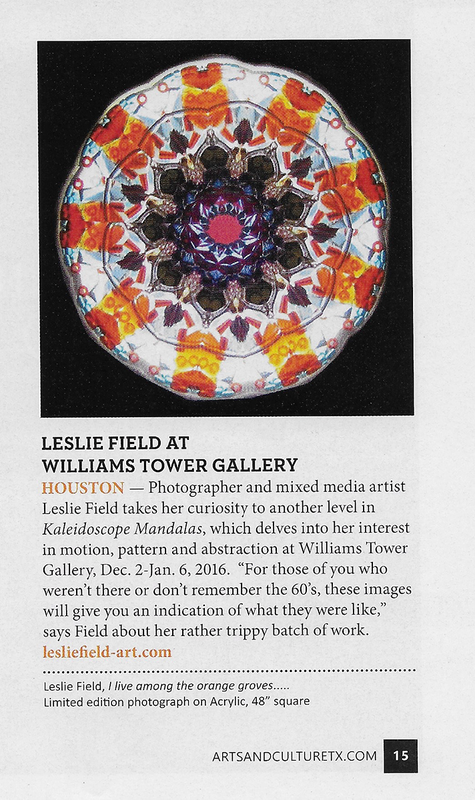 Leslie Field at Williams Tower Gallery, Houston - Photographer and mixed media artist Leslie Field takes her curiosity to another level in Kaleidoscope Mandalas, which delves into her interest in motion, pattern and abstraction at Williams Tower Gallery, Dec. 2-Jan. 6, 2016. "For those of you who weren't there or don't remember the 60s, these images will give you an indication of what they were like," says Field about her rather trippy batch of work. 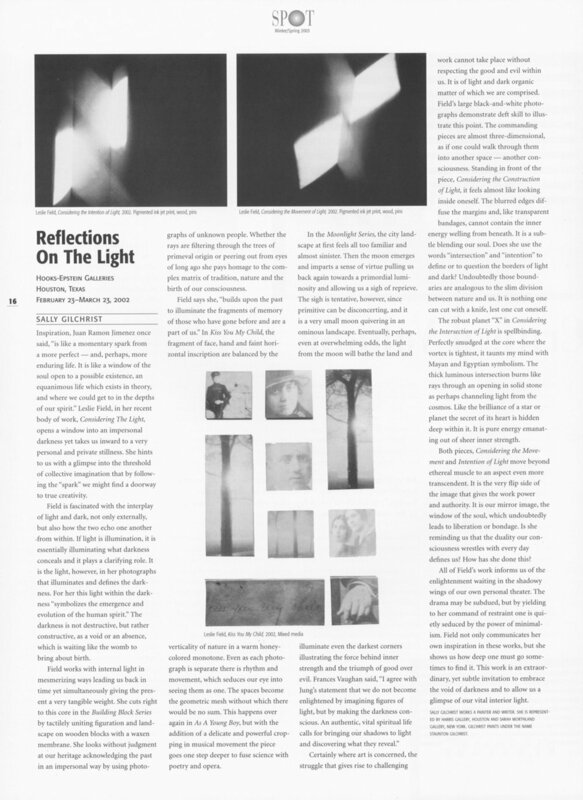 Gilchrist, Sally “Reflections on the Light.” Spot Magazine. Winter/Spring 2003. Meeks, Hillary S. “Playfulness and fantasy: Michelson exhibit likely to raise questions from patrons.” The Marshall News Messenger [Marshall, TX] November 18, 2004: Page 1, 3A. Print.